Our last full day here in the Philippines was packed with memorable moments and joyful fellowship. We have truly enjoyed getting to know Pastor Callejas and his family. Tonight they treated us to some delicious pizza after the evening service! Our children really enjoyed getting to know everyone. Micah liked talking about spiders, reptiles, snakes and a whole host of other critters with Pastor Callejas’ three sons. He was especially fascinated to hear about T.J.’s tarantula collection. Earlier this morning, as well as tonight, I had the privilege of speaking at First Sunshine Baptist Church, Pastor Callejas’ congregation. This wonderful group of believers are committed to faithfully serving the Lord. Our kids had the opportunity to join in the Sunday School at First Sunshine and were the center of attention! Of course, all of this transpired today (Sunday), but we also had a very memorable final night at Haven of Grace with the local children on Saturday. Since the local children knew Saturday was our final full day staying at the camp, they were at our door at 7:30am. They stayed throughout the day and asked if we might have a campfire on the beach that night. It was a lot of fun, and certainly a night we will not soon forget. In the picture below, Micah is holding a small fish he caught in one of the pools of water on the beach side of the breakers. Here Vincent is proudly displaying a crab he caught on the beach. This has certainly been a memorable 24 hours to cap off a memorable trip! We will appreciate your prayers for us as we leave early tomorrow for the States. Before leaving Haven of Grace, I wanted to give you a grand tour of the house and property we have been staying at. This will be our home when we return. Here we have the boys and girls rooms. They are very spacious! Just outside of our front door there is a large lanai that we have converted into an indoor soccer field. Micah has spent countless hours out there playing soccer with the other boys. The favorite item on the lanai for Lydia and Jonas has to be this play house. They have enjoyed playing in the house with their friends. In the Philippines the most popular sport (by far) is basketball. We get to enjoy having a covered, full-sized basketball court in our backyard. The property, of course, is used for camps and, Lord willing, a full-time seminary. The two buildings in this picture can house dozens of resident seminary students, in addition to the hundreds of campers who pass through each summer. Here are a couple of other buildings on the property, including the cantina and a number of pavilions. The sunsets here are breathtaking. This picture was taken from our window in the living room. I don&apos;t think I will ever get tired of that view, and this picture really doesn&apos;t even do it justice. We are grateful for such a beautiful place to call home. Most of all we are thankful for all of the new friend we have met during our stay here. We are praying the Lord will bring us back soon! Filipino days tend to start early. The sun rises a little after 5am and activities for the day seem to begin much earlier than they do in the States. I have enjoyed telling our Filipino friends about how long our days are in America during the summer and how short they become in the winter. Days here in the Philippines do not fluctuate in length anywhere near what we experience in the U.S. This morning was another early one for us. We had to be on the road before 7am to make it in time to speak in chapel at Sunshine Christian School. This was another great time with some great young people. I was glad to have Micah and Kiersten along with me on this trip and they enjoyed interacting with the children. After I spoke, we enjoyed some fellowship with Pastor Callejas and his wife. Once we left Sunshine Christian Academy we left for another speaking engagement–this time at an Outreach Bible Study held on a sugar plantation. This was a great opportunity once more to preach Christ and the Gospel. We have been very thankful for the many opportunities to minister here in the Philippines! As our day of ministry comes to a close here in the Philippines, many friends in the United States are just beginning theirs. Today was another blessed day filled with fellowship, preaching, teaching, and fun. I was grateful for the opportunity to speak at Maranatha Baptist Church once again. After preaching in the morning service we were off to enjoy a delicious meal and some wonderful fellowship with Pastor Jun and his family along with Pastor Harry and his family. The pictures below say it all! Jonas and Micah loved both the chicken and the fish. Following our lunch, I had the opportunity to speak to the young people and young professionals&apos; group from Maranatha Baptist and Sunrise Baptist Church. We focused on forgiveness from Matthew 18. It was an engaging study on this topic from the Word of God. We ended out the day being encouraged by a message from Pastor Harry in the Sunday evening service, which was then followed by more fellowship over pizza. What a wonderful day to serve the Lord and be blessed by God&apos;s people. For those just beginning their day on the other side of the world I pray you will find the same joy with your church families as well! Ministering to children is dear to the heart of God. When Jesus’ disciples rebuked parents for bringing their children to Him, the Bible records that Jesus “was much displeased” (Mark 10:14). He then commanded: “Suffer the little children to come unto me and forbid them not: for of such is the kingdom of God” (Mark 10:14). In fact, Jesus would even go so far as to say that unless we all become like little children, we will not enter the kingdom of heaven (Matthew 18:3). And lest there be any confusion regarding the quality little children possess that opens heaven’s gate for us, Jesus tells us plainly what it is in the very next verse: “Whosoever therefore shall humble himself as this little child, the same is greatest in the kingdom of heaven” (Matthew 18:4). Humility is the key ingredient in receiving grace and forgiveness from God. We must recognize our sin (a very humbling act), and turn to Jesus Christ as our only hope. Because children are so precious to God, they ought to be precious to us. Today I had the privilege of ministering to a wonderful group of children at Maranatha Baptist Christian School. What added to my joy on this trip was that Kiersten was able to join me. We left the house at 6:00 am, and I really enjoyed her company on the ride. She had a good time seeing the other children as well as getting some one-on-one time with Daddy when we stopped by the store to pick up groceries. She is maturing into such a wonderful young lady. Chapel, though was only part of our interaction with children throughout the day. Over the past three or four days, our children have been playing with some neighborhood kids as well. They play basketball, soccer, and eventually make their way up to the apartment. We seem to have anywhere between 8-15 additional kids in the house at any given time. There has definitely been a lot of excitement. Please continue to pray that the Lord will open doors of opportunity for us to minister to these children! 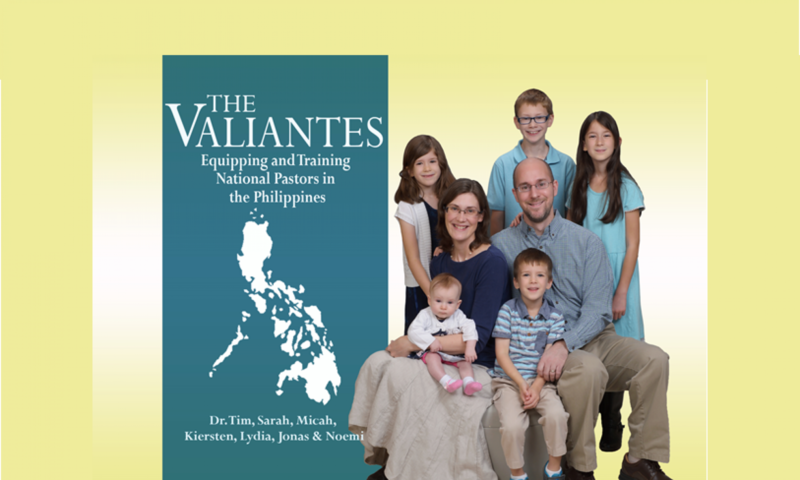 If you were to ask me the reason our family is following God’s leading to the Philippines, you will find the answer in the pictures within this post. Over the days we have been here, God continues to confirm His direction for our lives by firmly impressing His call upon us to come and help equip and train national pastors here in the Philippines. Yesterday I had the privilege of speaking to a great group of pastors. This is one of many pastors’ fellowships that regularly meets throughout the city of Bacolod. These men are faithful servants of the Lord who are being used in different places of His vineyard. My hope is to come alongside of these men and have a part in better equipping them for the work God has called them to do by offering accessible seminary-level training. I also long to help train young men who are rising up within their congregations who will soon assume the important and weighty role of shepherding God’s flock. In fact, the weighty responsibility of pastoring a church was the focus of yesterday’s message from Revelation 2. The picture below reminds us that each of these men have wonderful families and represent great churches. This is a picture of our family with Pastor Kiram and his family. Pastor Kiram and his dear wife have welcomed us so graciously, and it is our prayer that we might also minister to them and be a blessing in return. On Sunday, I had the joy of preaching at Pastor Kiram’s church, Sword Baptist, and meeting his family, along with the congregation he serves. We are rejoicing in the opportunities God has afforded us in this trip to encourage those who are faithfully serving Him! We are thrilled to announce that Lighthouse Baptist Church (Newark, DE) officially voted last night to become our sending church. We are so glad to partner with a ministry that has been such an important part of our lives. Please take a moment to check out the back of our prayer card we are now able to officially release. And be sure to check out our website for updates. First off, let me say thank you for your prayers for our family as we traveled to the Philippines. It has been a great trip, and in this post, I hope to share a bit of what we have witnessed through the eyes of our children. Before I do, though, let me first say how thankful I am for the four children God has blessed us with. Naturally, as Sarah and I looked ahead to 24+ hours of travel with children ranging in age from 10 down to 3, we were naturally concerned with how everyone would handle it. Twenty-four hours is a long time to travel for an adult, much less a 9 year old, or a 3 year old. Thankfully, the trip went as smooth as possible, and our children were amazingly well-behaved. As I commented to Sarah, we have had trips to Walmart (a 15 minute drive) that had more whining, fighting and frustration than the 24+ hour trip to the Philippines. With that as our backdrop, here are some of the highlights (through our children’s eyes) from the trip thus far. When we arrived, we were greeted by Pastor Jun and Mrs. Juvi. These wonderful folks have become very dear to the children in such a short period of time. They even went out of their way to make sure the kids got something to eat after arriving at our hotel at 11:00 at night. We stayed in our hotel for the first night to get some rest before heading to Haven of Grace. In the morning, we got our rental car and visited Maranatha Baptist School and got to see the children there enjoying the festivities of a national holiday. It was there our children were swarmed (in a good way) by dozens of other kids their age. Kiersten and Lydia were immediately welcomed into a group of other young ladies, and within minutes they were braiding Kiersten’s hair. Micah was surrounded by boys who were interested to learn more about him. After visiting the school we went to what Kiersten described as “The biggest mall she had ever seen.” This was our first trip to get some of the supplies we would need for the weeks we will be here. By the end of our shopping trip, everyone was starting to feel the effects of traveling the day before. We arrived at our home at the Seminary, made a simple dinner of Macaroni and Cheese and Fresh Mangos that Mrs. Juvi gave us, and we were off to bed. This morning we have had a day filled with playing and exploration. Each of the children have enjoyed fresh coconut milk cut down from the property and playing with neighborhood children. They have enjoyed looking for frogs, and geckos. Adventures abound. This has been quite an adventure thus far, and we are only a couple of days in. Please continue to pray for the rest of our time here that we will stay healthy, hydrated (Micah wanted me to add that), and that we will be able to minister to the folks here. The saying goes, "A journey of a thousand miles begins with a single step," or as in our case, "A journey of 9,000 miles begins at JFK (New York)." We are thankful for the safety in arriving at this starting point of our journey. We will be posting updates during our trip and hope you will be able to keep up with our adventures. Thank you in advance for your prayers on our behalf. This month marks the first steps in our family’s journey to the Philippines. Over the coming months our schedule is filled with a visit to the Philippines followed by visits to churches as we present our ministry and raise support for the work God has called us to. We are excited to partner with Pacific Rim Missions International (https://www.pacificrimmissions.org/) to launch Haven of Grace Seminary just south of Bacolod on the island of Negros in the Philippines. Our vision is to see a thriving, biblically-sound seminary established at Haven of Grace that will have an impact for the Gospel of Jesus Christ not only in the Philippines, but all throughout Southeast Asia. This month we have already had the opportunity to present our ministry at Lighthouse Baptist Church (Newark, DE). In just a couple of weeks Lighthouse will vote to officially become our sending church. Of course, this is the ministry I had the privilege of serving at for 7 years as an assistant pastor. It was a joy to reconnect with so many folks at Lighthouse who are so dear to us, as well as to get acquainted with many new friends who have joined in the years since we left. During our time at Lighthouse, I (Tim) had the opportunity to present our ministry to the congregation and preach in the Sunday evening service on August 6. It was an added blessing to connect with three Filipino believers who are a part of the church. On Wednesday we joined in LBC’s mid-week “Refresh” service and it was a joy to worship together among a body of believers that feels like family to us. During this service I shared a challenge from 1 Thessalonians considering how the Gospel “thundered out” from the church at Thessalonica. For Sunday, August 13 we initially planned to join my parents at their church (Bensalem Baptist Church), but I received a text on Saturday morning from Pastor Witmer (Lighthouse’s pastor) asking if I might fill in for him on Sunday morning since he had come down with the flu. So, it was an unexpected blessing to be with the believers at Lighthouse once more and open the Word of God to them. As I write this update we are now just 5 days away from the start of our 3-week trip to the Philippines. During this trip our hope is to get the family acclimated to a new culture, unique foods, and a different climate. We would appreciate your prayers for us that we might have a safe trip, stay healthy, and enjoy our time with the believers in the Philippines. I would also appreciate your prayers for me as I will be preaching and teaching throughout our time there as well. Once we return home from our trip we will be visiting churches to raise monthly support. It is hard to know how long this process will take, but we are praying that the Lord will allow the support to come in quickly so we can make it to the field as soon as possible. But even in this request we say, “May God’s will be done.” If you would like to support us, please stop by our website (valiantes.com) to find out how you can help. Also, if you would like to be added to our email list to receive our monthly updates via email, contact us through our website or send an email to tim.valiante@gmail.com. Once more, we thank you for the love and support you have offered to our family during this time of transition.